Auto Repair Industry Update: ASA rep details what's happening legislatively in D.C., around country - AutoInc. WASHINGTON, D.C. – ASA’s Bob Redding, the organization’s Washington, D.C. representative, offered a legislative update for the beginning of 2019, discussing vehicle safety inspections, data access, OEM repair procedures and aftermarket parts. During his appearance on “Facebook Live,” Redding began with developments in Missouri, what he deemed the ideal “template” for other states to follow in terms of automotive programs. “Almost every year, the Missouri Vehicle Safety Program is attacked in the state legislature. Last year, it was in the form of House Bill 1444. Unfortunately, we’ve seen House Bill 451 reintroduced. We need to stop it and in working with industry partners we hope we can do that,” Redding said. Only 15 states in the US currently have state vehicle inspection programs, with as many as 30 boasting them in the past. “We think these are invaluable to protecting the motoring public. We would like to see the 15 maintained and enhanced to other states,” Redding said. And it seems a logical step, as many in legislature — particularly U.S. Senators — have raised concerns about autonomous vehicles and their safety. “So where is the responsibility? What professionals are looking at these vehicles to ensure they are safe?” Redding asked. Recalls also come in to play. Many responsible independent repairers look for recalls on their customers’ vehicles – without being mandated by a state program. However, these recalls would be expedited much faster with mandatory inspection programs. 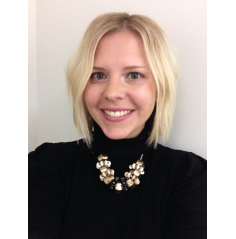 “This is a critical piece in consumer education. Take the Takata recall, for example. It would have been an immense benefit to have shops engaging with consumers,” Redding said. WATCH REPLAY! Be sure and turn up your sound! In 2013, Massachusetts and six other states introduced legislation on Right To Repair, along with legislation at the federal level. Now a bill was introduced at the end of 2018 in Massachusetts with changes to the bill regarding telematics, R2R provisions and data access. “Data access is the new service information. ‘Data access’ is the catch phrase you are going to see over and over in legislation and at the federal level. We need to ensure, in legislation, it does what automotive repairers need it to do,” Redding said. Another top-of-mind legislative issue is ensuring OEM repair procedures are used. Stemming from concern that these procedures were being bypassed, New Hampshire has introduced a bill that will help support the use of these procedures and payment at the shop level. “Through CIC, ASA meetings and meetings with OEs and other industry stakeholders, we have reaffirmed the importance of maintaining OE procedures in the shop. Now multiple states are drafting legislation, but this does not include parts. I look forward to more discussion about this,” Redding said. What Redding deemed a battle between David and Goliath, Wyoming — out of character for a state not deemed “heavy transportation” — introduced Senate Bill 0095 that attempts to define national certification for aftermarket crash parts. “This is legislation that has been tried with little success over the years. What state agency is equipped to evaluate the certification standard of aftermarket crash parts? Who will certify? How does this protect consumers? And the National Highway Traffic and Safety Administration (NHTSA) has rebuked any effort to develop certification for aftermarket parts or standards,” Redding said. The legislation thus far has passed within two weeks without enough collision shop input. Redding concluded his update with a push for industry constituents to join ASA. “We have found there is power in numbers. We need more members need to speak up. We need to make sure we are at the table when decisions are made. If you aren’t at the table, you are very likely to be on the menu,” Redding said. 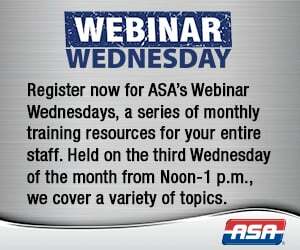 ASA will also be hosting a webinar on March 20 discussing further legislative issues. 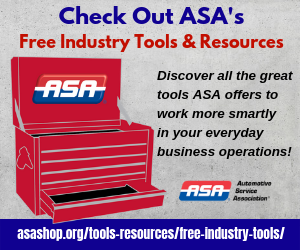 Sign up at asashop.org/webinars.